If you’re currently suffering from bill shock, it’s easy to assume that this is it… this is where you’re stuck forever – in a spiral of expensive bills and anxiety. 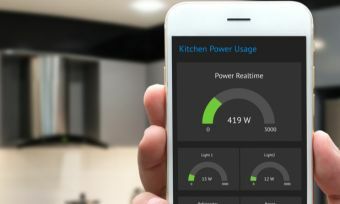 While it’s all well and good looking at the energy rating of X appliance that uses Y amount of energy, until you start seeing concrete, real-time figures, it can be hard to know what the silent energy killers in your home really are. This is especially true for appliances and other things that did not come with an energy ratings sticker. But you don’t have to be trapped in a vortex of budget busting and bill shock by these mystery appliances. Furthermore, some states make it mandatory for electricity distributors to supply a smart meter with your account, but this is not the case everywhere. So if you’re out of luck with smart meters, don’t panic, there are several workarounds to this dilemma. How can I calculate my bill before the bill comes in? Yes, this may bring back some bill shock bad memories, but often most of the details you need are in your energy bill. The total cost of your energy bill is divided up into different tariffs, supply charges, GST, and is convoluted further if you have peak/off-peak charges. At the end of the day, the only rates that matter are your supply charge and how much your provider charges per kWh. Often, in Australia this is around 26c, but can easily be much higher. Many bills also detail how much different your usage is from the same period last year. This can often be a good tip-off as to what caused a surge in your energy bill. Did you get a spa or pool? Did you get another housemate? Did grandma or the kids move back in? Did you get another fridge or washing machine/dryer? Did you get an air conditioner? You might even find your conditional discount has expired. All of these factors could in fact impact your energy bill, so it’s important knowing how to read your energy bill in the first place. 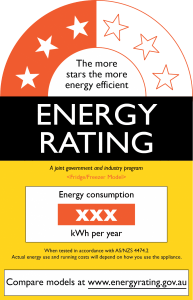 Most of us know about the energy ratings sticker (pictured) that is placed on many large appliances, but smaller appliances often do not have this sticker. Not to worry though, because there is often a plaque on or under the appliance that lists its wattage. Generally, this is considered one of the least accurate ways to gauge energy usage. This is due to the fact that things like settings, frequency of use and the age of the appliance can also influence usage. Nevertheless, these plaques/information cards serve as a good starting point to identify suspect energy suckers. This is generally more accurate than looking at usage ratings. This is where your energy company guesstimates your electricity bill from, and providers may not even check it if the meter is in a potentially dangerous area – for example, in the same area as a big, protective dog. But Fido won’t likely bite its owner, so it can pay to go outside and have a look. Generally you observe the meter over a set period of time, switching on and off various appliances to see what can cause a spike in the meter. This is where the limitations come in; appliances like fridges generally cannot be turned off so meter readings may not always give the best accuracy. The best course of action is to switch off every device except the one you want to measure, but this obviously is not always possible. This has the potential to be the most accurate way to measure usage, yet also the most tedious. Barring buying 20 of these meters – called ‘watt-hour meters’ – you generally have to leave the device plugged in between the wall and the appliance for some time to get an accurate reading. This can take some time as many appliances cycle on and off compressor operation among other things. Basically these device meters read in real time how much a particular device is consuming. For the most accurate read, leave the device plugged in for a week to get a good scope of energy usage, and to figure out whether its stated energy usage is accurate at all. For example, you might find that a fridge is labelled at 400kWh for the year, but in that particular week the meter says it consumes 10kWh, which is far out of the scope of what was stated on the sticker. Air conditioners also have the potential to use up lots of energy. Having a device meter plugged in with your air conditioner can be an accurate way to determine how much air con could affect your power bill. So while a bit of foot work is required to guesstimate how much you’ll be paying on your electricity bill, it can be very worthwhile if it means potentially saving money and eliminating problem appliances, or limiting their use. How much does a device meter cost? Unfortunately, you’re going to have to spend a bit of money if you want to save a bit of money. Some device meters cost over $100, but some can be had for $20 or thereabouts. Expect the dearer meters to include extra functions like switching between imperial and metric units, with some even being able to predict your bill in dollar terms. Of course, the cheaper ones may offer limited functionality, which could mean you’ll still need to sit down with a pen and calculator to see how much you’ll be paying this quarter. However, the money you spend on the meter could potentially be saved later on down the track, as well as provide you peace of mind and better empower you with knowledge for the next time your power bill rolls around.